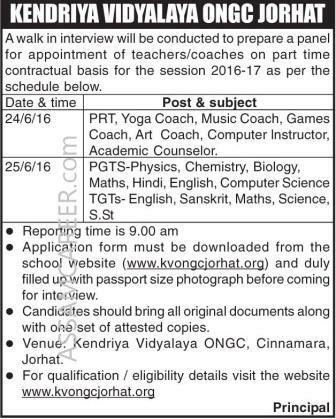 A walk in interview will be conducted to prepare a panel for appointment of Teachers/ Coaches on part time contractual basis for the session 2016-17 in Kendriya Vidyalaya ONGC, Jorhat as per the schedule given below. 2. 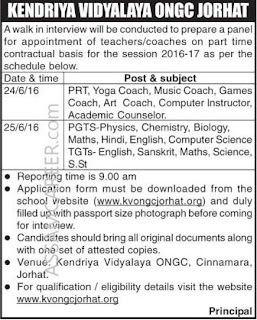 25/06/2016: PGTs: Physics, Chemistry, Biology, Maths, Hindi, English, Computer Science. TGTs: English, Sanskrit, Maths, Science, S. St.